Both Dr. Ronald Koopman and Quest’s John Cornwell made it clear in their presentations — and we agree — that the primary property determining a chemical’s propensity to form a ground-hugging cloud is its volatility, which can be assessed by either its vapor pressure or, more simply, by its boiling point. We already have two major large-scale demonstrations of ground-hugging toxic-cloud behavior: 1) the “Goldfish” test of hydrofluoric acid (boiling point of 67F) and 2) the infamous Bhopal disaster, which released 90,000 lbs of methyl isocyanate (boiling point of 102F). MHF (boiling point of 73F) is slightly less volatile than HF and more volatile than methyl isocyanate. These three substances — HF, MHF, and methyl isocyanate — have similar toxic-cloud-forming behavior, with MHF falling in the middle of the pack. No further large-scale demonstrations of MHF’s toxic ground-hugging behavior are needed. It’s time to ban MHF. The TRAA Science Advisory Panel has the highest respect for the Southern California AQMD Staff. However, the Staff has been directed to do the impossible — to come up with mitigation measures for massive amounts of one of the world’s most dangerous industrial chemicals in an industry with a terrible safety record prone to explosions and fires and in a highly populated area. As directed, the AQMD Staff has come up with conceptual ideas for mitigation enhancements; however, it did not evaluate their effectiveness. Since the AQMD meeting was at a middle school, we thought we’d grade the effectiveness of the mitigation concepts against a purely hypothetical release: An 80,000 lb object, hurled by an explosion from 12-stories high, rips off the 6-inch-diameter feed pipe from the bottom of a settler tank. This almost happened at the Torrance Refinery on Wednesday, February 18, 2015. All of the MHF would be expelled in less than a minute. For those who doubt this type of accident is too unlikely to ever happen again, consider the April 2018 explosion at the Husky Refinery in Superior, Wisconsin, which was similar in cause to the February 2015 explosion at the Torrance Refinery. In the Wisconsin incident, the explosion hurled a piece of debris through the wall of a storage tank releasing 15,000 barrels of hot asphalt that subsequently ignited (see picture below). The image on the left shows the hole in the asphalt storage tank at the Husky Refinery in Superior, Wisconsin, and the image on the right shows the hot asphalt pouring out prior to igniting. The resulting fire threatened to release hydrogen fluoride from the nearby alkylation unit into the community. A large portion of Superior, Wisconsin up to ten miles downwind was evacuated. An additive of 6 wt% is too little. That’s only one additive molecule for every 100 HF molecules. All HF released before spray is initiated. None present at release site and they are entirely ineffective against flash atomization. All HF released before evacuation is initiated. Even perfect zero-second response time won’t help. No time to alert the community. No time to alert the community. Even were it possible, hopeless traffic gridlock. [Koopman] said that an accident involving a truck carrying hydrofluoric acid would pose a “potentially worse” problem than an accident at a plant better equipped to deal with the chemical. Except for a 15 wt% sulfolane additive, which increases the boiling point of HF modestly from 67F to 76F (see chart below), MHF trucks have none of the other refinery-based mitigation systems. With an air temperature of 87F, highway surfaces can reach 143F. The stored thermal energy in a hot highway would vaporize MHF into a highly toxic cloud. To be an even partially effective as a mitigation measure for transportation, the Sulfolane level should be increased to at least 70 wt%. 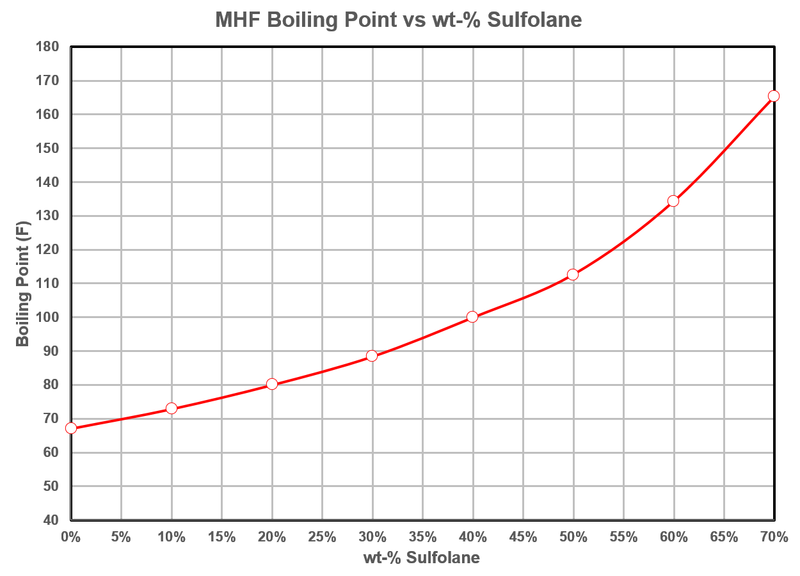 This MHF Boiling Point vs wt-% Sulfolane curve is derived from Dr. George Harpole’s chart of MHF Vapor Pressure vs Temperature. 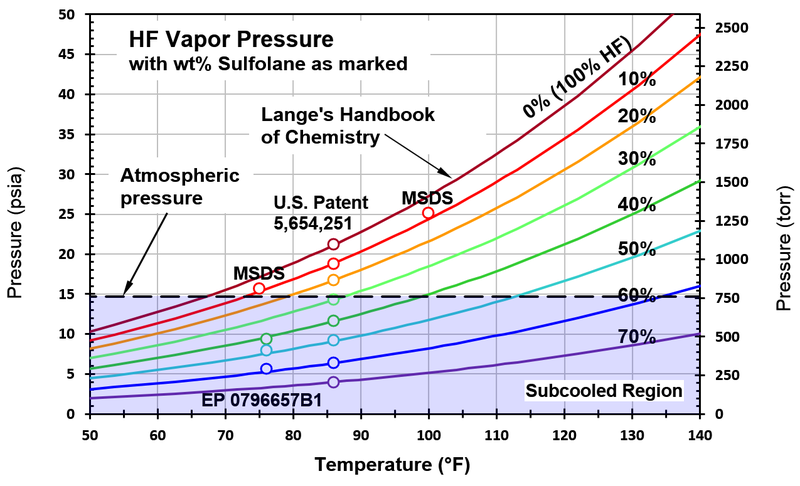 The boiling points are temperatures at which the vapor-pressure curves cross the atmospheric-pressure line. Click graph to enlarge. Cold HF aerosol cloud reacts with water-spray curtain in 1987 Goldfish Test. Evacuation for several miles downwind of an MHF truck incident in a highly populated area such as Southern California is impossible. SCAQMD staff needs to focus on the 33,000 lbs of MHF per truck delivery just as much as it does on the 50,000 lbs of MHF in each settler tank. Most of the water spray won’t intersect the MHF plume. For top-of-tank release like the Marathon Petroleum Refinery in 1987, most of the MHF will boil-off governed by heat transfer from the environment to the liquid mass. The release can take hours, not the 10-minutes assumed by the AQMD Staff. The duration of water spray must be sized for hours, not ten minutes. There is no Factor of Safety used in the calculation of the water supply to account for unknown factors. A Factor of Safety of at least five would be prudent. Taking these three items into account shows the AQMD’s estimate of water supply, described on page 30 of its PR 1410 Working Group Meeting #8 presentation, is inadequate by a factor of several hundred. MHF is so deadly, and there are so many possible rupture configurations, the effectiveness of MHF and other mitigation systems cannot be evaluated against a worst-case release in a full-scale test at the refineries. The only time we will find out who is right about the mitigation system’s effectiveness — the TRAA Science Advisory Panel or the refinery engineers — would be if a major release were to happen. The only effective mitigation we can all agree on is to ban MHF as soon as possible. Previous Previous post: “HF Boil-Off from an MHF Spill on Hot Highway Pavement” by Jim Eninger, Ph.D.
Next Next post: “ToRC Misinformation in Postings about MHF” by George Harpole, Ph.D.